Description: Dual auto plug adapter. Plug into power outlet to charge personal devices. USB output: 5 Volts / 2.0 Amps. ABS plastic. 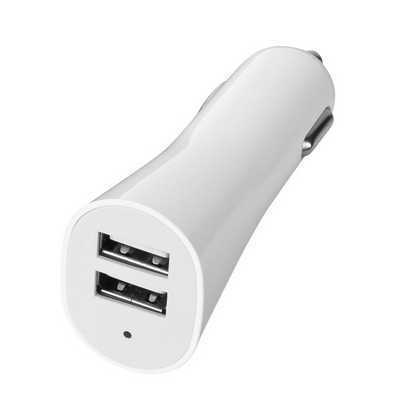 Features: Packaging: Charger is packed in a polybag and preseted in a plain white tuck box. Box size: 85mm(w) x 40mm(h) x 28mm(d). Colour: White Material: ABS Plastic Product Size: 80mm x 35mm x 25mm. Freight details : 200 per carton, 8.5kgs, 48 x 22 x 26cms; Decoration Type(s): Colour Print / Full Colour Print / Print with Dome Decoration Area: Pad: 15mm(w) x 10mm(h). Price includes : 1 Colour 1 Position Print. Setup is included.